Every meat eater loves a good steak. But I bet most people find it hard to cook steaks to perfection. I know I did. If you're not a skilled chef, how do you know whether your steak is rare, medium rare or medium without cutting into the meat? There are probably not a lot of people who want their steaks well done. Overcooked steaks, to me, are a waste. If I want meat to be well done, I'll buy a cheap stewing cut. But how do you make sure you don't overcook your expensive grass fed steak? One method of determining this, is using your hand, like described over here. That's great, but the problem with it, is that by the time I figured out if the firmness of the steak is indeed the same as the firmness of the muscle at the base of my thumb, the steak is usually overcooked. Maybe I'm an idiot, but this method never worked for me. In my opinion there is only one way to really make sure you get your steak exactly the way you want it. Buy a meat thermometer! Really. Do it. They're awesome. I own a thermometer from Ikea. It's very cheap and extremely useful. It even beeps when it's at the set temperature, so you don't have to watch it. 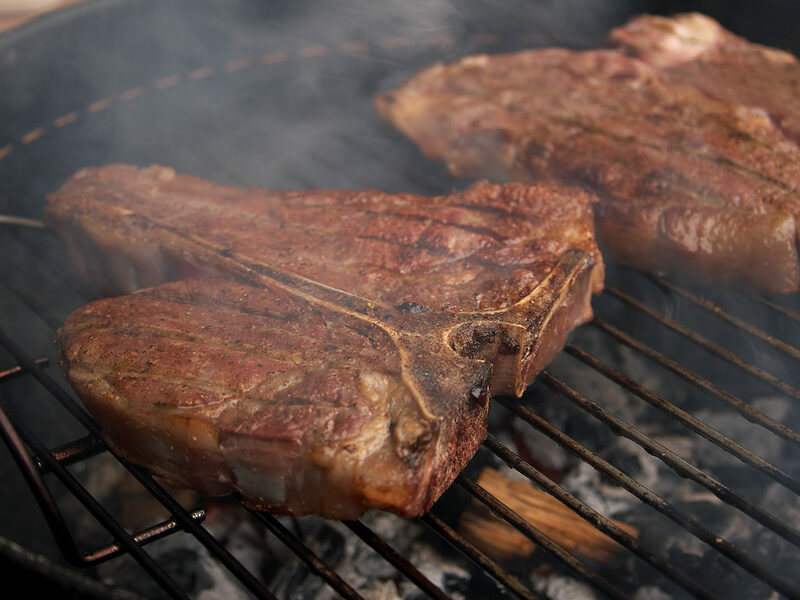 It doesn't matter if you fry the steak, cook it in an oven or on a barbecue, this always works! Pat the steak dry. Use whatever spices you want on the raw steak (usually, I use nothing but a sprinkle of salt and pepper). Put some fat in a skillet. Use fat that has a high smoking point, like ghee, lard or beef tallow (otherwise your kitchen will be filled with smoke).Wait until the fat is very hot. On high heat, sear the steak for about a minute on one side, so it browns and crisps a little. Turn and sear the other side for a minute. If it's a thick cut steak, you might want to sear the sides also. Turn the heat to medium-low. Put the thermometer in, and when it's about halfway the temperature you want it to be, turn one more time. Put the thermometer in again. If you're about 5 C. (41 F) away from your preferred temp, put a good knob of butter in the skillet. Wiggle your steak through the melted butter, tilt the pan, pick up some of the melted butter with a spoon and baste your steak with it a few times. Now, all you do is wait for the temperature to be exactly right. Then you turn the heat off, and serve your perfect steak. It doesn't matter how thick cut the steak is, or what size, a certain core temperature always corresponds with the rareness (or doneness) of the meat. Since I use this method, I haven't screwed up my steaks anymore. *Note: It's also a perfect tool to make sure some meats are thoroughly cooked, without having to cut it open to check. For instance, you don't really want to eat chicken at less than 75C (167F), because of bacteria. I smothered my steak in melted butter last week for the first time after being a lifelong A1 Steak Sauce fan. How in the world do they squeeze 6g of carbs into 2 Tbsp of A1? I digress. The butter on the steak was outstanding, and I'll never miss the A1. I had the most amazing steak in Beverly Hills and I'm going to try everything until I can make one that compares to it!